I am very glad to have your letter of 21 March, and to see the letter that you are sending off to NATURE. I think that it is fine that there are now two proposed structures for nucleic acid and I am looking forward to finding out what the decision will be as to which is incorrect. Without doubt the King's College data will eliminate one or the other. We have taken care of the trouble of too small van der Waals contacts in our structure by rotating the phosphate groups. I do not think that the matter of repulsion between the charged phosphates is an important one. I am not saying, however, that I feel strongly that our structure is right, rather than yours. I am glad to have your letter, and to know about your plans. I shall arrive on the morning of 3 April, as communicated to you already, and I shall meet you at the terminal in London. I do not have any hotel reservations of any sort, nor any definite plans for the visit in England. Will you please make whatever plans are necessary for us. I had thought that we would stay in Cambridge throughout the period of our visit. Riley has written that he would be pleased if we could visit him in London. Perhaps it would be worth while to check our bags and spend a part of Friday at the Royal Institution, and then go on to Cambridge or Oxford. It might be good for you to get in touch with Miss Franklin, if you decide that this is a good plan, and arrange for us to see her also. If the Kings College people (Miss Franklin has left Kings College, and is with Bernal at Birkbeck) express an interest in having me visit their place, perhaps this could be worked in on the same day. I am not planning, however, to approach them on the matter. I feel that we must spend sometime in Cambridge. If we go up to Cambridge Friday evening, we might stay there until Monday, and then take off for the continent – my plane leaves about 1:30 PM on 6 April, for Brussels. Another possibility is to stay in Cambridge from Friday to Sunday, to shift over to Oxford, in order to see Dorothy, on Sunday, and then to go down to London Monday morning. This means spending a good bit of time traveling, however, that could be better used in talking to people in Cambridge, and I feel that it would be best to plan to visit only London and Cambridge during the three days of my visit. I have received a letter from Watson and Crick, describing their structure briefly – a copy of their letter to NATURE is enclosed. The structure seems to me to be a very interesting one, and I have no strong argument against it. I do not think that their arguments against our structure are strong ones, either. It is evident that one structure or the other can be eliminated easily. Their structure places two nucleotide residues in the length 3.4 Å along the axis of the molecule, and ours places three nucleotide residues in this length. Data on the cross-sectional area of the unit of structure of a fiber, the composition of the specimen, and the density of the specimen should decide definitely between these alternatives, and definitely eliminate one of them. These data would not, of course, show the other structure to be correct in its details. In our paper we give an argument, based on data for sodium thymonucleate, to support the assignment of three nucleotide residues to this length of 3.4 Å. However, if the specimen of reasonably dry nucleic acid contained about 30% water (50% on the pure sodium thymonucleate basis) there would be only two residues in this length. Our own measurements, which are only rought ones, favor three residues, but they are not good enough definitely to eliminate the possibility of two residues. I think that the Wilkins photographs should settle the question definitely. We are finishing up the job of determining the revised parameters for our structure. It will not be done, however, before I start out on my trip. I am just putting the final touches on my paper on a new theory of ferromagnetism. It will appear in the May issue of the Proceedings of the National Academy of Sciences. Letter from LP to Prof. G. V. Raynor RE: encloses a copy of his manuscript on the theory of ferromagnetism. Discusses that incompatibility between the resonating-valence-bond theory of metals and the old free-electron theory. [Letter from Prof. Raynor to LP March 17, 1953] [Filed under LP Correspondence: Box #340, Folder #18]. Letter from LP to Theodore McClintock, W.H. Freeman and Company, RE: Overviews conventions of units and his preferences for usage in the second edition of General Chemistry. 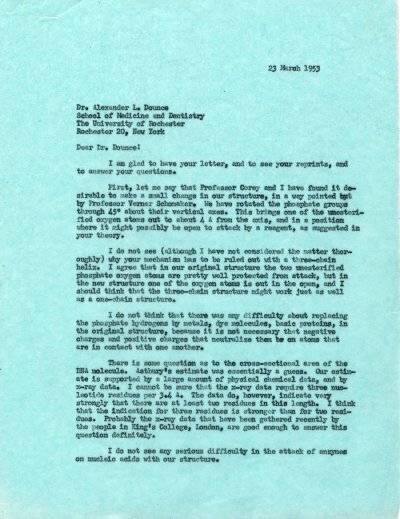 [In reply to March 20, 1953 letter from McClintock to LP and March 23, 1953 letter from McClintock to LP]. [Filed under LP Books: Box 1953b, Folder 1953b.1]. Letter from W. Albert Noyes, Jr. of the University of Rochester to LP RE: request information from LP about stipends granted to graduates at Caltech, as a means of comparison between British and U.S. Schools. [Letter from LP to Prof. W. Albert Noyes, Jr. December 16, 1953] [Filed under LP Correspondence: Box #279, Folder #5. Noyes, W.A. 1938-1971: file (Noyes, W.A., Jr. 1938-1971)].